FELA OF AFRICA, 20 YEARS AFTER. | Welcome to Dare Lasisi's blog! FELA OF AFRICA, 20 YEARS AFTER. You kissed the dust before your 60th birthday, we still call you Baba 70 till today. You're for ever alive in our hearts. You inspired the younger generation to challenge Vagabonds in power with your sermons as a Chief Priest of African Shrine. You dragged the oppressors in the mud with your Afrobeat music without fear. You predicted the menace of unknown soldier and army arrangement, one of them is still inactively in Aso Rock. Bamaiyi humiliated and brutalised you for no reason under the sun and you re-coined his name as 'Bami yi igbo', help me wrap my weed. You sang about 'Why Black man dey suffer?" over 30 years ago, Suffer don dabaru many sense for Nigeria now.Era of suffering and smiling. You deposited the mock coffin of your cherished mother at the doorstep of the oppressor without fear of bullets. Like a human bee, you stung our internal colonialists plus their foreign collaborators without mercy with your toxic venom.Baba Eleniyan, you're too much! Fela, gadfly of African dictators and conscience of Africa, you died as a Legend. Baba Eleniyan, turn in your grave to see 'Colo mentality' all over Nigeria and Africa, our beloved Chief Priest of the African Shrine. 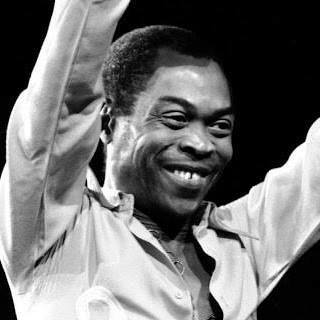 Peace, peace and perfect peace for Olufela Olusegun Anikulapo-Kuti. Welcome to Dare Lasisi's blog! : FELA OF AFRICA, 20 YEARS AFTER.